The need for psychologists is growing at an astonishing rate of 14%, according to Bureau of Labor Statistics (BLS). As more insurance companies cover mental health treatment, more patients can seek treatment, which leads to increased demand for qualified professionals. A doctoral degree in psychology prepares graduates to help these patients. However, there are many other career paths available: Degree holders can also work as professors, researchers, or healthcare managers. In all cases, this degree prepares a student for a challenging, impactful, and stable career. What Else Can I Expect From an Online Doctorate in Psychology Program? 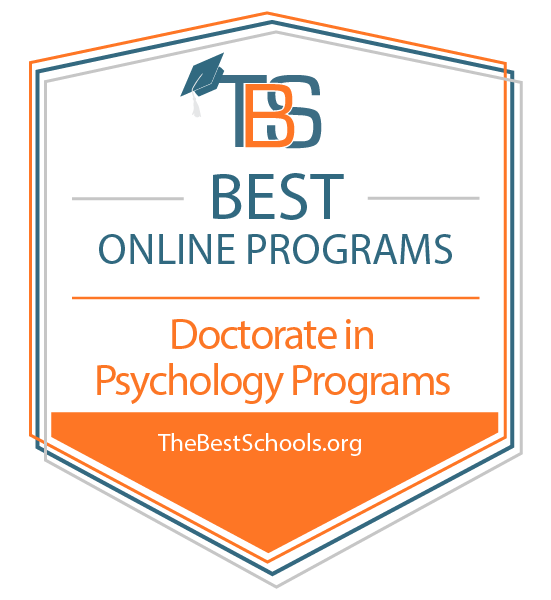 Online Doctorate in Psychology Degree Program Ranking Guidelines: We selected the degree programs based on the quality of program and range of courses provided, as well as school awards, rankings, and reputation. Established in 1978, California Southern University is a private, for-profit institution that offers associate, bachelor's, master's, and doctoral degrees. Distance learners can earn their doctorate in psychology online. Over the course of 66 credit hours, a doctoral project, a practicum, and an internship, students take clinically focused classes that emphasize counseling and therapy techniques. All courses can be completed online, while the practicum must be done at approved local sites. The one-year, 1,500-hour internship is optional, but helps students meet qualifications for licensure in many states. The online PsyD program meets the educational requirements set by the California Board of Psychology. Students interested in clinical psychology are prepared to sit for licensure exams in California upon graduation. Incoming students may transfer up to 30 credits toward their degree. Full-time students can typically complete all graduation requirements in four years. CalSouthern is regionally accredited by the Western Association of Schools and Universities (WASC). Located in Santa Barbara and established in 1974, Fielding Graduate University offers several distance learning programs in psychology, education, and organizational studies. Students can earn a online Ph.D. in psychology in six years. Degree candidates choose from concentrations in forensic psychology, health psychology, neuropsychology, parent-infant mental health, and social justice and diversity. Courses are offered online. However, completion of the degree requires attending occasional residential meetings. Training in quantitative and qualitative methodologies prepare learners to make scholarly contributions to the field, and students must complete an original research project and produce a dissertation at the end of the program. Applicants submit a current curriculum vitae, critical-thinking writing sample, statement of purpose, and three letters of recommendation. Additionally, application requirements include a bachelor's degree, minimum 3.0 GPA, and copies of official transcripts. Transfer students may be eligible for reduced degree requirements, course credit, or waivers of coursework. In total, online learners need 179 semester credits to graduate. Fielding is regionally accredited by the WASC Senior College and University Commission (WSCUC). The program also has probationary programmatic accreditation from the American Psychological Association (APA Commission on Accreditation). MSU is a public research university with over 50,000 students. Distance learners can earn a Ph.D. in educational psychology and educational technology in a hybrid, cohort-learning format. This degree is completed in five years: during fall and spring semesters, students take one online course, and in the summer, they complete two in-person courses. Students may begin only during the summer semester of even years, so applications are due on December 1 of odd years. Applicants must possess a master's degree, submit their GRE scores, and must have a minimum 3.5 GPA. MSU expects online Ph.D. psychology students to have strong research skills and takes into account the integrity and research requirements of applicants' master's degree programs. Graduates from master's programs that did not emphasize research or require a master's thesis may be offered admission on a provisional basis. MSU is regionally accredited by the Higher Learning Commission (HLC). The program also has programmatic accreditation from the American Psychological Association (APA) Commission on Accreditation. At Saybrook University, degree candidates can earn a Ph.D. in psychology. This is a hybrid program with synchronous courses built around scholarship in existential, humanistic, and transpersonal psychology. The majority of class requirements are completed online with periodic in-person residential conferences or intensives. Students may choose from optional specializations in consciousness, spirituality, and integrative health; creativity study; existential, humanistic, and transpersonal psychology; or psychophysiology. Those who do not declare a specialization follow a general psychology curriculum. Full-time degree seekers should expect to spend 5-7 years completing the course sequence of 68-83 doctoral core credits or, with previous master's degree transfer credit included, 128-143 total credits. Incoming online Ph.D. psychology students can transfer up to 12 credits in the psychology discipline. Applicants should have a master's degree and 3.0 GPA or higher from their last degree-granting institution. Saybrook is regionally accredited by the WASC Senior College and University Commission (WSCUC). The online doctor of psychology program at Southern California Seminary prepares students for ministry opportunities in the local church, private practice counseling, and service in organizational or institutional settings. The school's unique blend of theology and psychology provides distance learners with the skills to counsel individuals, families, and communities in church-based and secular environments. Learners may take specific training courses for licensure preparation in sexuality, substance abuse, child/spouse abuse, or elder care. All students complete 12 credits of dissertation research. A doctoral internship, with a minimum of 500 clinical hours, is required for graduation. All courses, except for one intensive and one lab, are completed online. By the end of the second year, online Ph.D. psychology students undergo an in-person evaluation with their professors. Poor grades or reviews can result in a student's removal from the program. Applicants must submit a reference letter from a pastor or chaplain, official college transcripts, an essay, and a master's-level writing sample. SCS is accredited by the Transnational Association of Christian College and Schools (TRACS). The Chicago School offers a Ph.D. in international psychology that prepares distance learners for leadership positions in multinational organizations. Graduates of this cohort program work in government agencies, not-for-profit organizations, and international businesses. Degree seekers choose from concentrations in organization and systems or trauma services. All students must participate in two 9-day field experiences at international destinations under professor supervision. Additional doctoral degree options at the Chicago School include concentrations in general psychology, business psychology, and applied behavior analysis. Applicants for the online Ph.D. in psychology should have three or more years of experience in the field with a master's degree from a regionally accredited college or university. Previous transcripts should show evidence of at least three courses of undergraduate or graduate coursework in psychology with a "C" grade or better. Students planning to pursue the trauma services concentration must hold a master's degree in a counseling-related field. Applicants must also submit their official GRE scores for admission. Depending on a student's previous academic record and transfer credits, full-time students can complete this degree in as few as three years. Distance learners can pursue a doctoral degree in human and organizational psychology online at Touro University Worldwide. Students use applied psychology principles and evidence-based approaches to solve problems and explore research questions. Degree candidates complete 66 course credits and a dissertation. There is no residency, practicum, or internship required for graduation. Instead, TUW students engage in a guided dissertation research and writing process that consists of 27 credits. The convenient eight-week, accelerated courses are accessible from anywhere in the world and do not require textbooks. Applicants for this online Ph.D. psychology program must have a master's degree from an accredited institution with a minimum 3.4 GPA. Applications should also include an outline of careers goals, a short biography, two letters of recommendation, official transcripts, and doctoral entrance essay. The GRE is not required. Active military, veterans, and their spouses and children receive a significant tuition discount. TUW is accredited by the WASC Senior College and University Commission (WSCUC). No two American Psychological Association (APA)-accredited doctoral psychology programs are identical. Students should evaluate each program's curriculum, as each school offers unique courses and concentrations geared toward specific professions. Some universities offer specializations like educational psychology, substance abuse, trauma, sports psychology, and management. Learners with a firm understanding of their professional goals should choose programs with appropriate course offerings. Some universities, however, do not offer concentrations, instead using dissertations to allow students to define their interests. Many programs offer core courses like ethics, psychology practice law, mental health assessments, and group counseling methods. Some universities also offer classes that develop professional skills, including courses in research methods and pharmacology. Some schools integrate practicum requirements into their programs to train students to become licensed counselors. Online students who attend school out of state should ensure that program requirements meet their home state regulations. Ph.D. psychology online programs that are APA-accredited vary. Examine each program's curriculum to determine whether they have any in-person requirements like a practicum course or on-campus residencies. In this concentration, students examine learning practices from infancy through adulthood. Courses blend education and psychology research with subjects like educational philosophy, program evaluation, and human development in education. Graduates can teach and create educational policy. This concentration helps learners understand the psychological and physiological mechanisms of addiction. Students study treatment methods. Graduates may work in academia to find new treatments or as clinicians and rehabilitation therapists. This concentration often includes courses in coaching, motivation, and emerging research in sports psychology. Graduates can help professional athletes recover mentally from injuries, use cognitive strategies to enhance performance, and cope with stressors. Medicine can play an essential role in the treatment of mental health disorders. As such, psychology Ph.D. programs that are online and APA-accredited often offer classes that teach students about how medications work to correct chemical imbalances. These courses teach students best practices for psychology research, including synthesizing past findings to create a new research proposal, how to obtain International Research Board approval for human subjects, and how to present research to the community through conferences and journal articles. Before psychologists can treat patients, they must make accurate assessments of their mental health. These courses teach best practices for this process, even when patients have disorders that make assessments difficult. Some patients do better in group settings than in individual counseling sessions, but leading such groups requires a unique set of skills. These courses teach degree candidates to facilitate discussions and healing in this context. Although a Ph.D. in psychology online is a specialized program, learners can pursue several different career paths. A professional with an online Ph.D. in psychology can become a psychologist, college professor, or mental health services manager, among other careers. As psychologists, doctoral graduates work in clinical settings, including hospitals, in-patient facilities, and offices. Some psychologists go into business with a private practice. With an online psychology Ph.D. degree, a professional can help patients overcome mental health problems like anxiety, depression, addiction, and bipolar personality disorder. Some graduates from online Ph.D. psychology APA-accredited programs become university professors. These professionals train new psychologists and conduct research. Postsecondary educators enjoy stable careers in a fast-growing sector as more people attend college. Mental health departments, residential behavior centers, and outpatient facilities need qualified individuals to oversee them. Online Ph.D. programs in psychology prepare professionals to take on these roles with a firm understanding of what employees need to help patients.